I’ve had this song stuck in my head for days. As Tina so eloquently described on her post on the Adriatic coast, songs can be a bookmark in time. Hearing them brings us back to a particular moment in our lives that can’t be replicated. There are two songs in particular that will always remind me of my time in South America. Every once in a while, I offer a song from my past–a long distance request and dedication to my family. I first heard this song on a music box my mother gave me. She gave my two sisters and me a music box for every birthday growing up. What interested me more than the figures on top (like unicorns or little girls with umbrellas) was the music itself. I would open up the box and watch the small spindles going around as the music played. I would pluck them and hold them close to my ear to absorb the sounds. The boxes were my music even before radio. One of them played “Fly Me to The Moon” very slowly, so I thought that it was a heartbreaking song until I heard Sinatra sing it up tempo. The song I loved most was Both Sides Now, although I didn’t know the title at the time. The composer would become one of my favorite singers and songwriters. Mitchell’s lyricism and music is one of a kind. This song brings me back to Illinois, to our first home where I would sit on my bed with this music box on my lap. Now that I am old enough to understand the lyrics, it holds a new meaning. I have grown into it. What song will always remind you of home? I won’t lie–I got nothing this week. It’s finals time, and I’ve got a long way to go on grading. The last few brain cells are fizzling out. It’s cold and damp in our apartment. I just finished a decent glass of wine and ought to go to bed. I had to listen to this song before sleeping: The Postal Service’s “The District Sleeps Alone Tonight.” Have you heard it? No other song makes me as sad and happy at the same time. We`re biding our time in Porvenir, Chile, in Tierra del Fuego. Nearly at the end of the world in Patagonia. Getting away from the water, the smell of wild sweet clover permeates the streets. The evening boat back to Punta Arenas leaves at 8:00. I´m hoping to see a mini dolphin riding in the side wake when we return. E. caught sight of one on the journey into the port. I figured that´d be good luck. The day is strangely temperate and sunny for the bitter cold we´ve experienced in Punta Arenas. E. and I have another day in southern Chile, and then we´re back to summer in Santiago. The weather changes quickly in this region. It´s sunny one minute and pouring the next. The wind can be a monster. I can´t get the Dixie Chicks´song “Heartbreak Town” out of my head. Porvenir isn´t necessarily sad, it´s just that there is not much for the residents to do in their spare time. With the lack of a radio or iPod, my mind tends to put songs on rotate. During our hike in Torres del Paine, it chose a Phil Collins song “Do You Remember?” (Why?!?) I had to fight that song off with some Handel. However, Katy Perry (“Hot N Cold“) kept fighting Vivaldi for control. This weekend I should have some remembrances on the bus ride over to Santiago from Mendoza, initial thoughts on Santiago, Punta Arenas, Puerto Natales, Parque Torres del Paine, and Porvenir. Chileans appear to love eighties pop music as much as Argentines. If you love instant coffee, you´re in luck! We are on the road to Santiago, Chile. Here’s another long distance request and dedication to all of my family and friends. I wish the happiest of holidays for you. I miss you. 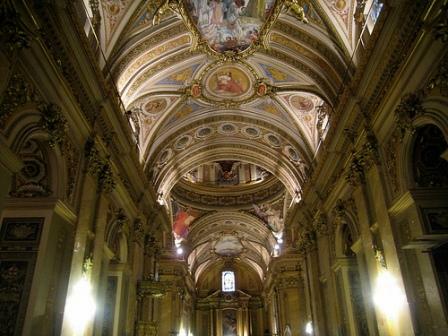 The cathedral at Plaza San Martín is the jewel of Córdoba, Argentina. On a Sunday morning, E. and I quietly entered the cathedral and listened to mass. Even if you don’t consider yourself to be a religious person, it would be a treat to listen to mass in this spectacular building and feel like a part of its history. 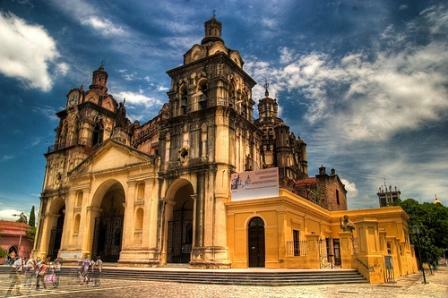 The Jesuit churches are the city’s main tourist attractions. They are located, for the most part, near the Plaza San Martín. The crypt “Cripta Jesuítica” is worth a visit, although you won’t see any bones.